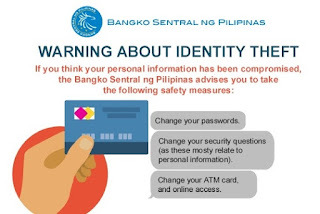 The Bangko Sentral ng Pilipinas (BSP) has recently issued an advisory against a cybercrime commonly known as identity theft. In light of the increasing number of online transactions, the BSP has warned the public to be extra careful with their personal information and to be wary about identity theft. The BSP says that if you think your personal data has been compromised, the following measures should be done ASAP: change your passwords, change your security question, and change your ATM card and online access. Meanwhile, if you think your personal information has been used by another person without your consent, the first thing to do is contact the creditor, financial institution, or company where the fraudulent transaction took place and contact all other institutions where you have accounts which you think will also be compromised. The Philippine National Police (PNP) and the National Bureau of Investigation (NBI) has special units devoted to tackle crimes such as identity theft. The BSP advises victims of identity theft to file a complaint at the PNP Anti-Cybercrime Group or NBI Cybercrime Division and to keep a copy of the police report which may be needed later in the investigation. Further, the BSP enjoins financial consumers to accomodate requests of banks and financial institutions for additional information which may be needed to improve security of their accounts. You can also email them at consumeraffairs@bsp.gov. ph or call at telephone number (+632) 708-7087.